Back to school. It’s the time of year when we kiss summer goodbye and return to our jobs, classes and regular routines. Although may of us appreciate this return, this can be a stressful time for your pet. They have likely been used to having their family around and having lots of attention and outdoor activity, cottage trips and swimming. It can be a big change and a stressful one, but it doesn’t have to be! 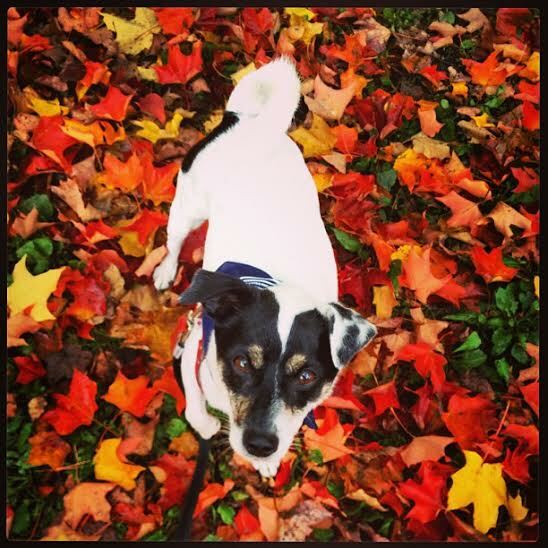 Here are some tips for easing the transition and keeping your pets safe this fall. 1) Stimulate your pets by giving them interactive toys. Toys can be fun and can provide a mental workout for your pet. This can prevent them from demonstrating boredom with chewing and excessive barking! Toys like the Kong and treat puzzle games are great for exercising their minds! Filling the treat puzzle with a portion of your pet’s kibble can also be a great weight loss aid! Kongs filled with a small amount of peanut butter or a portion of your dog’s canned food can be frozen for a longer lasting game. 2) Get physical! Exercise can be a great activity for the whole family! Physical activity can help reduce boredom and behavioral issues. It is important to schedule time to take your dog out for walks before everyone leaves for school and work. The whole family can participate after school as well with regularly scheduled playtime and walks. This can be a great way for kids and pets to enjoy some quality time together too. Cats can also burn some energy by playing with a laser pointer, crinkle ball or toy mouse! 3) Ease into routine. Routine makes our pets feel safe and comfortable. Back to school is a sudden change which can be a stressful event for your pet. If possible, try to ease this transition by slowly transitioning into a routine. This can be done a week or two before school starts by setting regular times for walks, play, meals, cuddles etc. 4) Save a special toy that your pet really loves and have your children give it to them just before they are ready to go out. Put it away again once the children come home so it remains the “special toy.” You can create a scavenger hunt game by hiding favorite pet treats around the house for your pet to discover while you are away. 5) Keep your pets on a leash! Back to school also means more traffic; cars, children, pedestrians and bikers. Everyone is rushing to get where they need to go. A dog running across the street after that squirrel or towards another dog may not be noticed in time! Keeping them on a leash is an easy way to avoid serious injury to your furry family! Saying good bye to summer and back to school is always a bit stressful for everyone, we hope these tips help make the transition a bit smoother. Wishing you all the best this school year! With the Labour Day around the corner there are lots of things to celebrate: the CNE is in town, fireworks, the Air Show, back to school…ok maybe somethings are more exciting than others. This time of year makes us all a bit anxious, including our dogs. Some dogs are so anxious during loud noises they will either spend their time cowering under the table, or if they’re like my dog, the bathtub, or worse, run away. If your dog is one of those high anxious dogs you may want to try a couple of these tips to help make the celebrations a bit more relaxing for everyone in the family. Keep your dog indoors or on a leash: Even the calmest dog can spook when they hear a loud bang. By keeping them close by you can ensure they don’t run off to hide. Adaptil: This is an appeasing pheromone naturally found in lactating dogs. The pheromone is released as the puppies nurse, making them feel calm. They have been able to synthesize this pheromone and is currently available as a spray or collar. For short term stressors we would recommend spraying their bed or a bandanna. The pheromone (that only dogs can smell) will last for 5 hours in the environment. 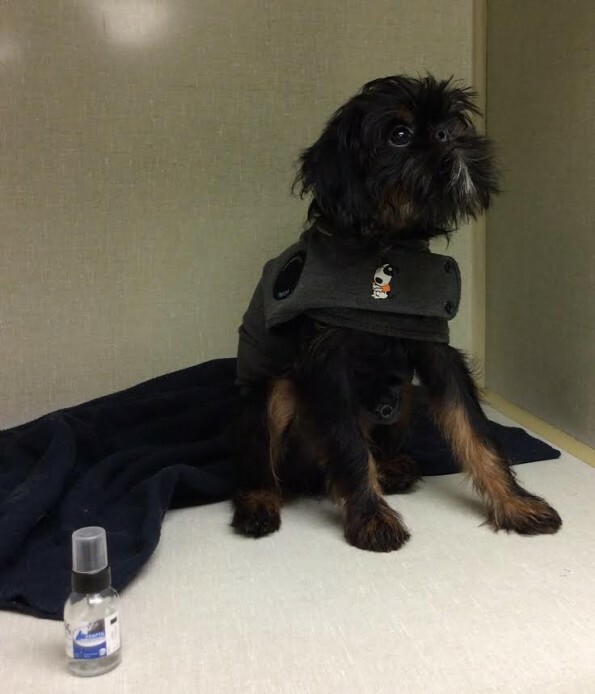 Thundershirt: This is a snug fitting shirt that applies gentle constant pressure on the dog’s chest. This technique has been used to successfully reduce anxiety for many years. This product also comes with a 100% guarantee! If you are not happy with the results, you can return the shirt for a full reimbursement. In very stressful situations such as the Air Show this weekend, we would recommend applying all 3 of these techniques. Spray the Thundershit with the Adaptil and keep your dog inside. If you have any questions about these products, or if you would like to try the Adaptil or Thundershirt, please stop by the clinic, we would be happy to help.